Venus continues its reign of the evening sky in the heart of Gemini at the start of June. Or should be way between the hearts of Gemini? Barely a week into the new month, the planet is heading out of Gemini and on the way to Cancer where it passes through the Beehive cluster on the 20th and 21st. Before then, watch a crescent moon nearby on the 16th and 17th. On the 20th, notice Mercury in the heart of Gemini where Venus started the month. The messenger planet is following the same track that Venus did, but it will take until July for Mercury to be near the Beehive. 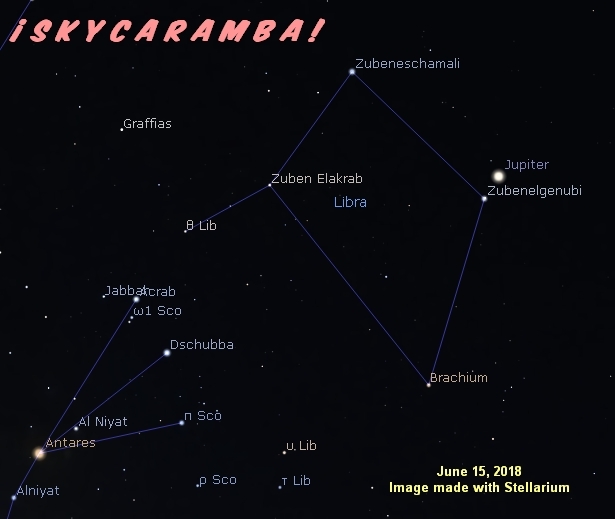 Jupiter is passing north of Zubenelgenubi in Libra as June starts. The big planet is retrograde, heading westward, slowly leaving the diamond. But it is not moving fast and remains near Zubenelgenubi all month. Saturn is at the top of the teapot in Sagittarius, retrograde, north of Kaus Borealis. With the ringed planet at opposition on the 27th, it is up nearly all night every night this month. It’s also closest to Earth. So June is a good time to point a telescope at it for a good view. Saturn’s distance from Earth at opposition will be 9.049 astronomical units (earth-sun distances). 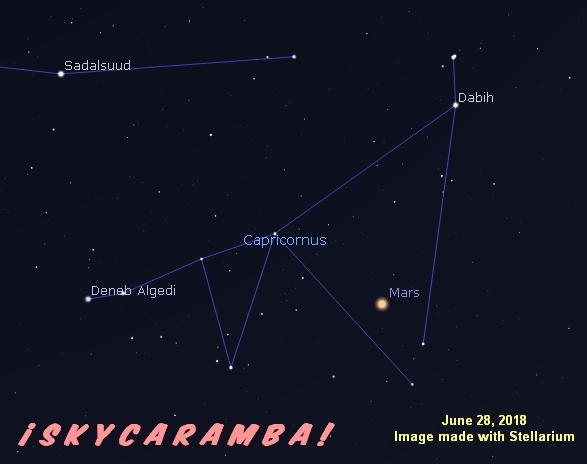 Mars is in Capricornus. Most of this month, it is in direct motion. But approaching the 28th, it becomes nearly stationary and then begins retrograde motion. The moon is at its first southern lunistice of the month on the 1st. It’s 20.7° south of the equator that day. The first of two lunar apogees this month occurs on the 2nd at a distance of 251,800 mi (405,300 km). Last quarter is on the 6th with the moon going north of the equator two days later. New moon happens on the 13th, followed by perigee on the 14th (223,400 mi or 359,500 km), and northern lunistice (20.8° north) on the 15th. First quarter is on the 20th. The moon crosses the equator going south on the 21st. Full moon occurs on the 28th. On the same day, the moon is at southern lunistice again, 20.8° south. The second apogee is on the 30th at 252,300 mi or 406,000 km. The moon is near Saturn on the 1st, Mars on the 3rd, Neptune on the 6th, Uranus on the 10th, Aldebaran on the 12th, Mercury on the 14th, Pollux on the 15th, Venus on the 16th, Regulus on the 18th, Spica on the 22nd, Jupiter on the 23rd, Antares on the 26th, and Saturn again on the 28th. Mercury is at perihelion on the 6th. It is 0.307 astronomical units from the sun on that date. The asteroid Vesta is at opposition on the 20th at a distance of 1.142 AU from Earth. The June solstice occurs at 10:08 UT on the 21st. Mercury is at superior conjunction (on the other side of the sun) on the 6th. Some other conjunctions this month: Mercury and Aldebaran 5.8° apart on the 3rd, Venus and Pollux 4.7° on the 8th, Mercury and Pollux 4.8° on the 25th. 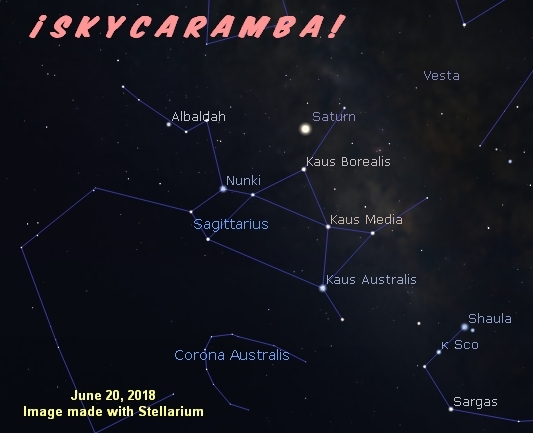 June 7 is the likely peak date of what would be renowned as one of the most active and most reliable meteor showers if not for it being a daytime event. Radar operators discovered the Daytime Arietids in 1947. There are around 60 meteors per hour at this shower’s peak. But since the radiant is close to the sun this time of year, we can’t see much of it. We can hope for a fireball or two just after sunset or just before sunrise. Amateur radio operators can enjoy the shower by “working” distant radio contacts via the ionization trails the meteors create. A rather unreliable meteor shower could peak on June 27. The June Boötids have produced four outbursts in the last century. The most recent was in 1998 when as many as 100 per hour were seen. Besides this shower’s unpredictability, it will be bothered this year by the full moon’s light.